So, you’re from New Orleans; you’ve lived here all of your life. Or, you are from out of town and have never heard of Plaquemines Parish (until the last hurricane, that is). Why in the world would anyone want to move to our beautiful new home community, located in Plaquemines Parish? Well, there are several answers to this question, and they just might surprise you. 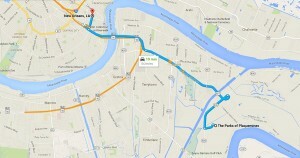 There are little-known benefits of living “off the beaten path,” but still just 10.2 miles from the Central Business District (CBD) of New Orleans. The first to mention, because it’s on everyone’s mind, is the safety from hurricane flooding. Even after Hurricane Isaac spun over South Louisiana during a period of more than 24 hours, The Parks of Plaquemines received absolutely NO WATER DAMAGE whatsoever. The community stayed high and dry. The reason for this is that The Parks of Plaquemines is protected by not just one levee but 2 major levee systems – the Federal Mississippi River Levee and the Gulf Intracoastal Waterway West Closure Complex, which is a system of floodgates, pumping and drainage, and an earthen levee. Not only did The Parks of Plaquemines not flood during Hurricane Isaac, but it also did not flood during Hurricane Katrina. 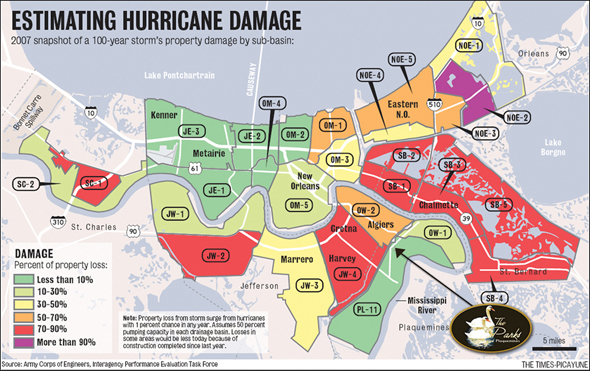 The Army Corps of Engineers estimates for flood damage in New Orleans put The Parks of Plaquemines subdivision in one of the safest areas on the Southshore – see the map below for more details. Another reason Plaquemines Parish is an ideal choice for your next home buying purchase are the schools. Plaquemines Parish has some of the highest ranked schools in Southeast Louisiana. LEAP scores in 2011 put Plaquemines Parish schools on the same competitive level as St. Tammany Parish schools which continue to lead schools in high student achievement in all of the Greater New Orleans area. For example, Belle Chasse primary fourth graders had higher LEAP scores than Mandeville fourth graders. Even with its close proximity to the City of New Orleans, Plaquemines Parish is a completely different parish government than Orleans Parish. Because of this, the Parish enjoys a substantially reduced tax rate than not only Orleans Parish but other neighboring parishes as well – savings of 80% – 156%. You may wonder why the tax rate in Plaquemines Parish is so much lower than other parishes. The reason lies in the solid, well-run government services in the parish. The way that the parish government is run and where the money is spent fosters education, public services – police, fire, and first responders, road improvements and repairs, and low tax rates! When the money is spent correctly, everyone benefits, and this is definitely evident in Plaquemines Parish. Because Plaquemines Parish is only accessible by 2 ways in or out of the parish, it is not easy for criminals to enter the parish, commit crimes, and then “escape.” Police presence in the parish monitoring these access is also a deterrent for would-be criminals. These factors cause criminals to look elsewhere to get away with mischief and result in a low crime rate in Plaquemines Parish. The Parks of Plaquemines benefits from low parish taxes, and the community itself also enjoys low water and sewer rents. Purchasing a home in Plaquemines Parish vs. other parishes raises your financial liquidity because you are not paying as much for taxes and utilities and therefore are saving money just by the location of where you live. What you would pay for homeownership in other parishes cannot even compare to the value of buying a home in The Parks of Plaquemines. 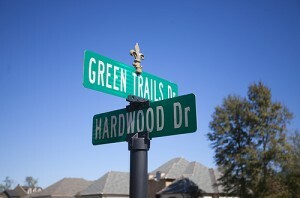 In addition to living in a safe parish, The Parks of Plaquemines is also a Gated Community, so additional safety measures have been put in place as an amenity in our community. If you would like more information about the benefits of living in Plaquemines Parish, Please Contact Us at 504-364-2350 or E-mail Info@TheParksLifestyle.com.